Today was about the smiles rather than the miles. We sure didn’t go twenty miles, but we did manage twenty smiles. Our old buddy Uke showed up last night with a posse of night hikers. At 1:30 am we woke up to hear someone saying ‘Chuckles and Spoon were here yesterday. They signed the guide book!’ Then Mark let the intruders know loudly that we were still there, and sleeping. As it turns out, our sleep interrupters were none other than the infamous Joe Cool, Uke, Scuba Steve and Peach Tree, who we had traveled with before we got off the trail for four days. Steady Eddie, who was also peacefully sleeping in the shelter, woke up and we all had a reunion, followed soon after by sleeping. We ran into the Blue Ridge Parkway today, which we’ll be traveling alongside of for a while. It is a lengthy reminder of civilization for us and runs for about a hundred miles over the Virginian mountains south of Shenandoah, leading up to the edge of that scenic park. This means, for us, lots of interaction with a scenic highway that we cross several times. Why drive to this vista when you could walk 735 miles to it? Roughly 13 miles into our day, we heard the first ominous rumbling of thunder. With the storm approaching quickly, we made it to a shelter just in time to watch a light sprinkle turn into another classic summer thunderstorm. Eddie got in slightly damp and Uke was unfortunately quite soggy by the time we all gathered beneath the roof. After a couple hours things ebbed enough to hike again but we had grown pretty comfortable and decided to make a dry night of it. On the bright side, Virginia has many shelters and we are starting to learn the rain’s patterns and early warning signs much better. Mark is working at becoming an expert of reading shaking leaves and wind patterns, and we are both learning how to live comfortably in the woods. 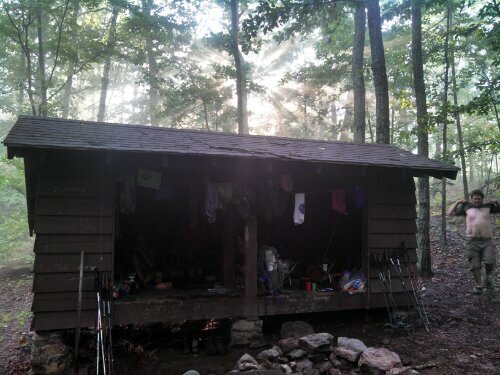 The shelter after the storm passed. See if you can find Steady Eddie photo-bombing us. Will you get close to Crabtree Falls? That was another favorite hiking destination from Charlottesville. We got close but didn’t quite hit it! 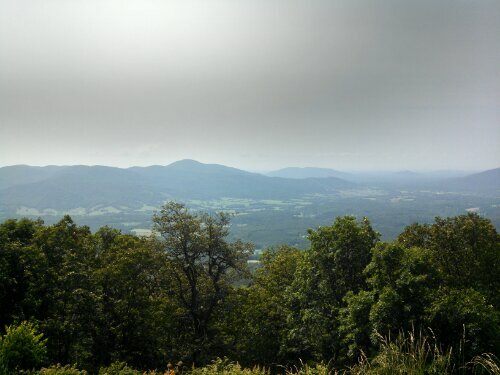 The beautiful, gorgeous Shenandoah Valley. Enjoy!